Hi- if you read one book this year (well hoping you read more than one- support your local bookseller!) make it this one- Food Rules An Eater’s Manual (Michael Pollan). Yes here we are in 2010 needing a manual. This is an easily accessible abridged version of his In Defence Of Food. He narrated Food Inc.-great movie-take everyone you know to see it. Food Rules is published in a gorgeous old Penguin B format which looks like a facsimile….the design suits the content- that is getting back to basics and thinking about food like our great grandmothers! We’ve reversed this food/health balance…the less we spend on food (eg cheap served through the car window food and processed supermarket food) the more we all spend on health care… and my own personal gripe- if food and nutrition are SO important why is this ignored by doctors, who seem to consider nutrition and healthy disease controlling food choices as some sort of black magic. 2.don’t eat anything that your great grandmother wouldn’t recognise as food- imagine she’s next to you in the supermarket looking in your trolley! 3.avoid food products containing ingredients that a third grader can’t pronounce and avoid food products with more than 5 ingredients-the rule is the longer the list of ingredients avoid it. 6.if it came from a plant eat it; if it was made in a plant, don’t. Can you see or picture the ingredients growing in their natural state? 7.eat wild foods when you can- eg wild greens are some of the most nutritious plants in the world. These greens are not bred for shelf life so have higher levels of everything. Here are his basic rules as summed up by the author. Great summary of the book – I read it a while back – wish more people would adopt his mantra. Thanks Jane-look forward to it. Ann is getting pretty good at making green smoothies too-converting more friends on the weekend! great post Jane – I used to be so amazing with my food and what I ate and didn’t eat -really tough these days married with kids – opt for easy options..also I love chocolate…how do we replace our chocolate fix with green smoothies? I know you will probably say in time the cravings will go away – or try carob in the smoothie or……..
Hi-thanks Sara-nothing wrong with chocolate!-I love chocolate! Life can be too stressful to completely ban all treats or comfort food. Pollan’s rule 60 is Treat treats as treats! So be choosy about the type and the ingredients…be selective- I eat organic raw dark chocolate that doesn’t have ANY dairy or sugar/additives- that’s what was in the cake. It is so rich you cannot sit and eat a whole block! One piece at a time and it’s medicinal!! 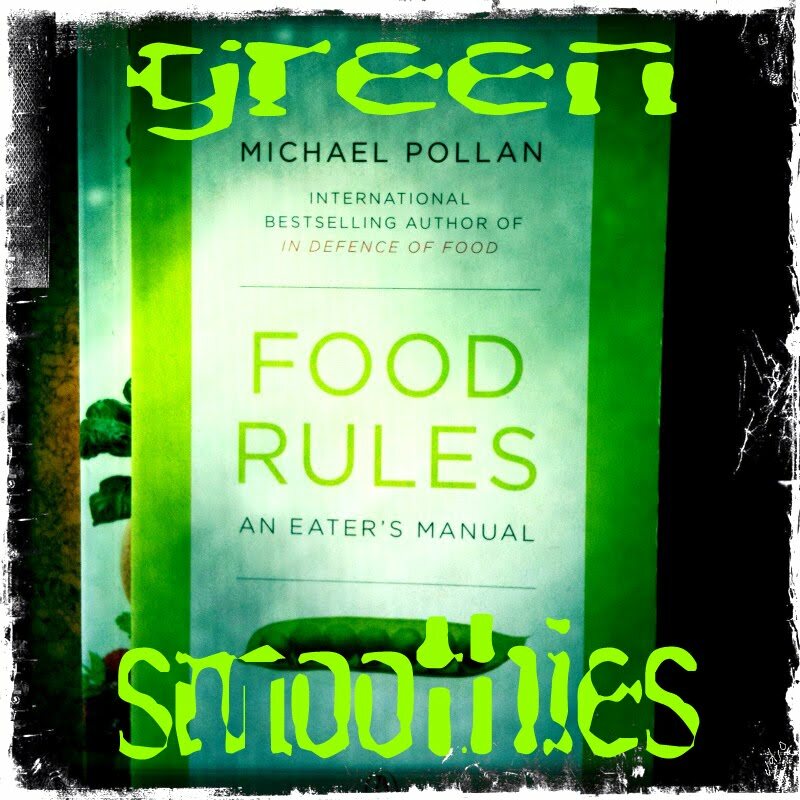 Greens make a heap of flavourings too in their organic choc like orange/almond/ginger/cherry/vanilla etc…yum. You can buy them in 15g blocks to try. I also use raw cacao powder that I mix in banana smoothies with oat milk with stevia…yum- or even in your green smoothie-cacao is a great antioxidant and mood enhancer- see last Easter’s post. Get into the health food shop and explore options. General cravings? Fill up on filling green smoothies (eg more greens than fruit-spoonable consistency) and always have one ready whenever you’re hungry/craving…fill up that Green jug and don’t share with anyone!!!! Wow! THIS is a great blog and talk about motivating! I just love what you’re doing here and will be following like a hawk! Thanks for coming by my blog so we could connect!